I just finished sampling a slice of this cheesecake. I love cheesecake and I love pumpkin and this combination didn’t disappoint. Brandon’s first comment was, “I can’t believe how much it tastes like pumpkin pie.” I think what I like best about it is that it’s not too sweet. The balance of flavors is perfect and the texture is nice. 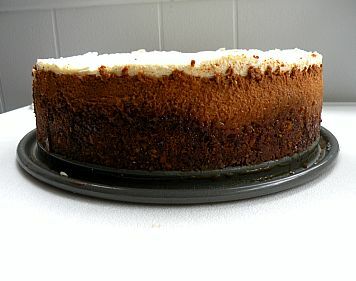 This cheesecake was published in Gourmet in November 2000. It’s received over 300 reviews and maintains a 4-fork rating. It’s definitely a winner if you’re looking for a holiday dessert. 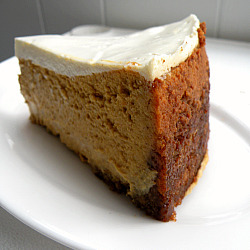 This cheesecake is a nice change from the traditional pumpkin pie. But don’t save it only for Thanksgiving, it’s a great dessert to serve throughout the fall and holiday season. I substituted ginger snaps for the graham crackers in the crust because I love holiday cheesecakes with ginger snap crust. Also, you can omit the bourbon if you’d like but the bourbon flavor is not very strong. If you’re a cheesecake and pumpkin lover this dessert is for you! Butter a 9-inch springform pan. Combine the crumbs, pecans and sugars in a bowl. Stir in melted butter and press mixture into the bottom and 1/2 inch up the sides of springform pan. Chill crust for 1 hour. Whisk together pumpkin, eggs, cinnamon, nutmeg, ginger, salt and brown sugar in a large bowl. In the bowl of a stand mixer, cream together cream cheese and granulated sugar for about 3 minutes. Add in cream, cornstarch, vanilla and bourbon and mix until incorporated. Add in pumpkin mixture and beat until smooth. Pour filling into chilled crust and bake the cheesecake for 50 to 55 minutes, until the center is just set. Remove from oven and let cool in pan for 5 minutes (leaving the oven on). Whisk together sour cream, sugar and bourbon in a bowl. 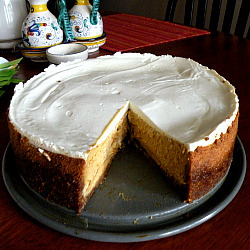 Spread sour cream mixture evenly over top of the cheesecake. Bake for 5 more minutes. Remove from oven and let cool in the pan on a rack for at least an hour. Place in refrigerator and chill covered overnight. Release cheesecake from pan and serve. I cannot wait to try this! Looks delish! Ok, you know I’m not a great cook, so I have a question – I don’t own a stand mixer for my tiny little kitchen… so can I use my hand mixer to beat the filling, or should I borrow one? I want to make this for thursday! I’ll FB you if I don’t hear back later tonight or in the morning.